Certified organic complete single protein wet food for adult dogs. Formulated to support eyesight & a healthy immune system. What is Rockster Superfood for Dogs? Certiﬁed organic complete wet food for adult dogs. 100% human grade carefully selected ingredients of the highest quality create this scientiﬁcally formulated single protein 100% additive-free superfood for your best friend. Gently poached to preserve vital nutrients and vitamins, this unique recipe includes 87.5% bio-organic salmon, calamari, & mussels. Essential additional nutrients are provided through a carefully formulated mix of bio-organic superfoods, including courgette, quinoa, quince & carrots, creating a balanced and delicious superfood with multiple health beneﬁts. This recipe has been enhanced with fermented Jerusalem artichoke concentrate, which has a highly beneﬁcial prebiotic effect to aid digestion and your dog’s ability to absorb the nutrients in this recipe, together with Omega 3 & 6 fatty acids derived from ﬁsh to support cell regeneration for the health of your dog. A Fisherman’s Dream represents A Taste of Napoli, and is inspired by The Rockster’s Journey. What are the benefits of using Rockster Superfood for dogs? Complete wet food for adult dogs. Suitable for dogs with allergies - genuinely single protein recipes. Free of exposure to growth hormones, antibiotics, pesticides, and chemicals. Natural pre-biotic to aid digestion. World's first certified superfood for dogs. What is in Rockster A Fisherman's Dream? Nutritional Additives:Vit. A 1.200 IU, Vit. E 12mg, Vit. B2 6mg, Vit. B1 2.5mg, Vit. B6 1.5mg, Vit. B9 0.3mg, Vit. B12 40µg, Biotin 36µg. Analytical Constituents:Crude protein 9.3%, Crude oils and fats 8%, Crude ash 2.4%, Crude ﬁbre 1.9%, Moisture 72%. 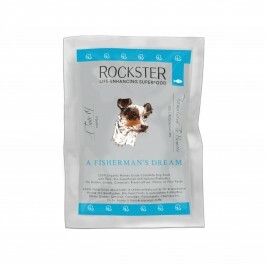 How much Rockster Superfood for Dogs should I feed? This Guide is approximate. Individual dog’s requirements will vary according to age, activity levels and metabolism. Nutri Dog Bakery produces high quality, complete dog food that provides great nutritional value and high protein levels. It is grain-free and is suitable for any breed/mix, at any age, with normal or sensitive digestion needs. Certified bio-organic complete single protein wet food for adult dogs. Formulated to support eyesight & a healthy immune system. Certified bio-organic complete single protein wet food for adult dogs. Formulated to support healthy hair & skin. Certified bio-organic complete single protein wet food for adult dogs. Formulated to support liver function & a healthy immune system. Certified bio-organic complete single protein wet food for adult dogs. Formulated to support healthy joints & cartilage. Edgard & Cooper wet food is a delicious & wholesome meal made from fresh meat. Grain & gluten-free. For all adult dogs.